All three personnel passed the course to particularly high standards. 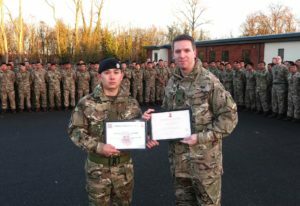 Lance Corporal Sonic Thapa made QOGLR history by passing the Skill at Arms Phase with a Distinction and securing an Instructor Recommendation on the Tactics Phase. The Section Commander’s Battle Course (SCBC) is one of the most challenging command and leadership courses in the British Army. It is conducted over a 16 week period at the Infantry Battle School, Brecon, in Wales. The course delivers competent and confident commanders for the Field Army by running command and leadership training, infantry tactics training, weapons training, and live firing range qualifications. Training for high-intensity, light-role war fighting is how JNCOs are prepared for any operational scenario they may encounter; conventional war, counter insurgency, security sector reform, peacekeeping or supporting civil authorities. SCBC is the promotion qualifying course to be a substantive Corporal and must be completed by all who aspire to be an Infantry Section Commander. It is renowned as a particularly arduous 4 month undertaking and it endeavours to select only the top candidates for progression. The course is divided into two main phases, Skill at Arms and Tactics, with each phase lasting 8 weeks. Every course loads 140 soldiers from across the Army.